Baptism. St Mary the Virgin, Wingham. This means that his mother was Judith Barrow. His parents were married in 1623. The gap before Abraham’s baptism means that there were probably older children who entries can no longer be read. We have no certain evidence of other siblings, but a younger Isaac and Michael Lilly were having children baptised in Wingham in the 1660s and 70s. These are either Abraham’s brothers or his cousins. Abraham was 12 when the Civil War broke out in 1642. The use of Old Testament names, and particularly the name Repent, means that the Lillys of Wingham had Puritan sympathies. They would have favoured Parliament against King Charles I. We do not know whether Abraham’s father fought in this war. 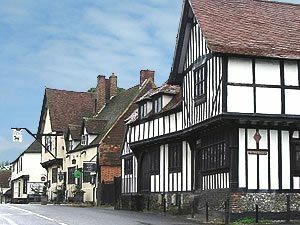 Wingham, like most of East Kent, tended towards neutrality. Wingham stands east of Canterbury, where the North Downs run down onto the plain. There was rich grassland by the River Wingham, a tributary of the Stour, and woodland on the Downs. This was fertile farmland, but the Lillys were craftsmen, rather than farmers. We know from the burial register that Abraham became a weaver. If we have read the entry correctly, he wove linen. We would expect Abraham to have married in the 1650s, under Cromwell’s Commonwealth, but we do not have evidence of his marriage. We learn from the burial register that his first wife’s name was Amy. AMY. This burial entry is the only direct evidence we have for Amy. We do not know her maiden name. Their first known child was baptised in 1660, the year when Cromwell’s Republican Commonwealth ened with the Restoration of the monarchy. Charles II succeeded his executed father Charles I. 1660 Dec 3 Abraham Lilly. At this period, only the child’s name is given, not the parents’. Isaac and Michael Lilly had children in Wingham a little later, but their marriages in 1663 and 1665 mean that this is almost certainly the son of Abraham and Amy. There is a second such short baptismal entry. 1665 Sep 6 Richard Lilly. On the face of it, this could be the son of any of the three Lilly men. But both Isaac and Michael went on to have sons named Richard later. This leads us to the conclusion that this too is Abraham and Amy’s child. Again, no parents are named, but it seems safer to assume that this is Michael Lilly’s son. We have found no further children for Abraham and Amy, but we cannot rule out the possibility that there are other baptisms which cannot be read. Burial. St Mary the Virgin, Wingham. 1675 Dec 5 Amy, wife of Abraham Lilly. Abraham appears to have remarried. Marriage. St Mary Bredin, Canterbury. 1677 Jul 22 Abraham Lilly married Elizabeth Paine. We have found no other evidence of an Abraham Lilly in Canterbury. Nor did this couple appear to have children there. This fits with a subsequent burial in Wingham. 1682 Sep 15 Elizabeth wife of Abraham Lilly. This could be the Abraham junior’s wife, but he would have to have married early and lost his wife soon afterwards. A second marriage for Abraham senior seems more likely. There do not appear to be any children from this marriage. Abraham and Amy’s second son Richard became a carpenter. Abraham himself died six year later. 1686 April 10 Abraham Lilly … Weaver. The word before “Weaver” may be “Linen”. If this is the older Abraham he would have been 56. He lived just long enough to see the accession to the throne of Charles II’s brother James II.